I’m planning a new garden for the Art of the Soul Center, a local space where I teach gardening and homesteading classes. Out back is a small, concrete-and-gravel-covered wasteland. A six-foot chainlink fence stands to the south, a dilapidated fence to the east, and the building itself to the north. If I can make a beautiful garden there, I can make one anywhere. I cannot freaking wait. I’m making notes and rooting through magazines like Urban Farm for examples, and I picked up a couple of creative ideas from The Small Budget Gardener. I’ll use bits and pieces left from other projects and ask around to see if friends have anything useful they want to get rid of. And by god, I’m going to finally use those freaking columns that have been moldering in the garage since I bought them eight years ago. My biggest concern is the raised beds. Because space is tight, I want the beds to be tall enough that they can be used as seats. But that means that A). the materials that make the beds have to be wide enough for people to sit on, and B.) the beds themselves have to be a bit taller than usual. As a result, I’ll need more material than usual. I have some wood in the garage I was considering using, but it’s not tall or wide enough to make seats. Pallets, which would be free, are too tall and don’t have closed sides. 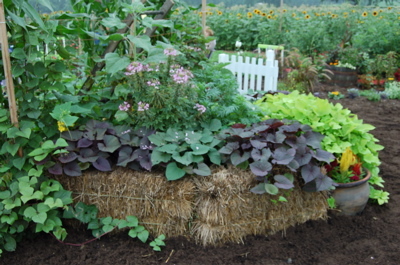 I could use hay bales, which would be fun: jam them side-by-side in a rectangle and fill the center with soil (see photo). Once the hay breaks down, I’d throw it in the compost. In the meantime, the bales are fairly comfirtable seats, if you don’t mind the occasional sharp poke in the rear. I’ll make a rain barrel out of a plastic garbage can I already have in the garage. A second can, this one with the bottom cut off and some holes drilled in the sides, will make a tidy small compost bin. (You just lift the can straight up and fork everything back in to turn the compost.) I have an old solid door in the garage I might be able to modify for a potting bench. And for general storage, it’s hard to beat cat litter buckets. They’re perfect for toting tools, taking with you when you weed to throw your debris into, and storing finished compost. Check back periodically for updates on my super-recycled urban garden spot. I’ll load photos as a the project moves ahead.